Said to be the first of its kind for a UK airport, a new electric car sharing service is being rolled out at Gatwick Airport. 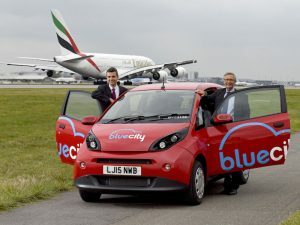 The service, run in partnership with the Bluecity scheme operated by Group Bolloré, enables passengers to collect vehicles onsite and drop them off at dedicated charging points across London. Providing further support, five charging points will be introduced at Gatwick in the coming months. Cedric Bolloré, director of development at Group Bolloré, added: “We look forward to collaborating with Gatwick Airport and offering passengers the opportunity to drive one of our electric cars.